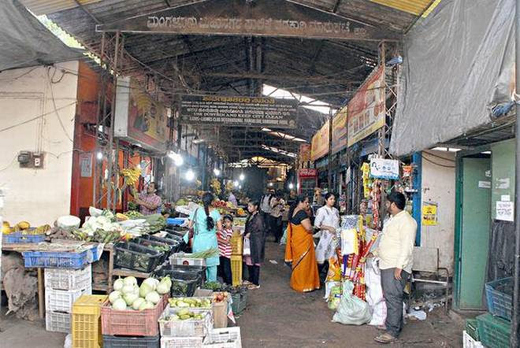 Mangaluru, Oct 3, 2017: The ancient popular market at Kadri Mallikatta is set to get a new structure as MCC has proposed to reconstruct it at an estimated cost of Rs. 16 crore. With the State government giving the technical approval for the proposed project, it now awaits administrative approval from the State Cabinet, according to Mohammed Nazir, Commissioner of the corporation. The administrative approval was expected within a month. The civic body would then invite bids for taking up the project. Bidders will have two months time to participate. With regard to the funding, the MCC commissioner said that the civic body would invest Rs. 4 crore from its enterprise fund and raise Rs. 6 crore through a loan from a nationalised bank. The remaining Rs. 6 crore will be taken as a loan from the Karnataka Urban Infrastructure Development and Finance Corporation (KUIDFC). He said the market complex would have a basement, lower and upper ground floors and three tiers. There would be provisions for selling meat and vegetables separately. In addition, the complex would have general stores/shops. The civic body had mooted the proposal more than a year ago by writing to the KUIDFC to prepare the feasibility report on the project on May 30, 2016. Finally the Urban Development Department approved the project in its meeting on September 26, 2017. Meanwhile, another modern market by Mangaluru Urban Development Authority (MUDA) for the corporation is coming up at Urwa Market. According to the MUDA, the six-storeyed building costing Rs. 12.29 crore would have 84,891.45 sq. m. Its work began nine months ago. Its basement, mainly for parking, will accommodate 73 cars and 40 two-wheelers. The same floor would have five shops. The lower ground floor will have 21 shops selling fish and meat. The upper ground floor will have 65 shops selling flowers, fruit and other products. The first floor will have 16 shops, including a canteen. The second floor will have eight offices and the third will have seven. The building is shown to accomodate 122 shops technically.